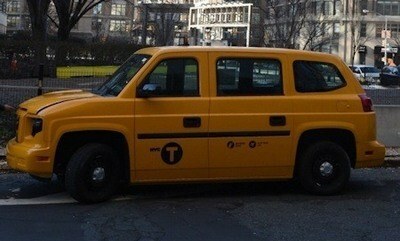 Synopsis : Fully wheelchair accessible the MV-1 Empire Taxi provides more legroom and luggage space than other taxi vehicles operating in New York City. Mobility Ventures LLC, today unveiled the "MV-1 Empire Taxi", a specially designed version of the company's MV-1 that provides more legroom and luggage space than any other taxi vehicle operating in New York City – and is fully wheelchair accessible. To mark the launch of the "MV-1 Empire Taxi", Mobility Ventures is offering a driver incentive bonus match to existing NYC Taxi and Limousine Commission (TLC) drivers, along with special MV-1 discount pricing. This will make the versatile "MV-1 Empire Taxi" notably less expensive to purchase and drive than a wheelchair converted NV200, (also called the "Taxi of Tomorrow. "), and support the TLC's goal of increasing the number of wheelchair accessible vehicles available to hail. Under this innovative program, an "MV-1 Empire Taxi" will be approximately $10,000 less to purchase than a converted "Taxi of Tomorrow". The new "MV-1 Empire Taxi" will have a special pricing of approximately $33,000. The TLC is offering drivers a $14,000 grant toward the purchase of an MV-1, or any other wheelchair accessible vehicle, bringing the net price of the "MV-1 Empire Taxi" to only $19,000. The TLC is also offering additional incentives to the drivers of wheelchair accessible vehicles, including a 50 cent per pick up payment to the driver. Under Mobility Ventures' "MV-1 Empire Taxi" program, for the first 25 drivers who purchase the vehicle, the company will match the TLC's 50 cents for every pick up in an MV-1. Drivers are eligible for $7800.00 in annual payments from the combined program for driving an "MV-1 Empire Taxi" based on an expected 150 rides per week. "The unmatched safety, reliability and ease of use of the 'MV-1 Empire Taxi', combined with this new incentive program, makes it the best choice for taxi drivers and fleet owners now making the switch to a wheelchair accessible vehicle," said Pat Kemp, Executive Vice President, Mobility Ventures. "We welcome and appreciate all efforts by the private sector to support greater accessibility in New York City's taxi fleet," said the NYC Taxi and Limousine Commission. Mobility Ventures recently partnered with the DC Taxi Commission (DCTC) to offer a similar incentive program in order to expand accessibility in the DCTC's taxi fleets. Late last year, Mobility Ventures delivered 14 new MV-1 wheelchair accessible taxis as part of a grant initiative that also offered vehicle operation training, free of charge. What Makes the "MV-1 Empire Taxi" Unique? Accessibility: The MV-1 is the only purpose built wheelchair accessible vehicle. The MV-1 redefines accessible transportation with a built-in side-entry power ramp, ample head room, and seating for up to five which includes the ability to safely accommodate two wheelchair users at a time - one of whom rides in the front and the other in the spacious passenger area - making it the perfect solution for consumers, commercial use, and government fleets. 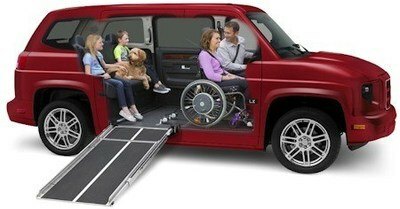 Safety comes first: The MV-1 safety record is unmatched by any wheelchair accessible vehicle, based on federal NHTSA safety recall data for aftermarket conversion vans. Additionally, the MV-1 meets all Buy America requirements. Durability: As the only Original Equipment Manufactured wheelchair accessible taxi on the market, the MV-1 is tough enough for New York City streets. With a maintenance cost below $1500.00 per 100,000 miles, it's the most cost effective too. Information about the MV-1 family of accessible vehicles can easily be found on our new website at www.mv-1.us The site includes useful information on building/customizing your own MV-1, vehicle specifications, a downloadable brochure, vehicle photos and the nationwide dealer network locations. *News Release by Mobility Ventures LLC: Disabled World makes no warranties or representations in connection therewith. PR content may be edited for style, clarity, and/or length. If you are connected with this page and want it corrected/updated please contact us.